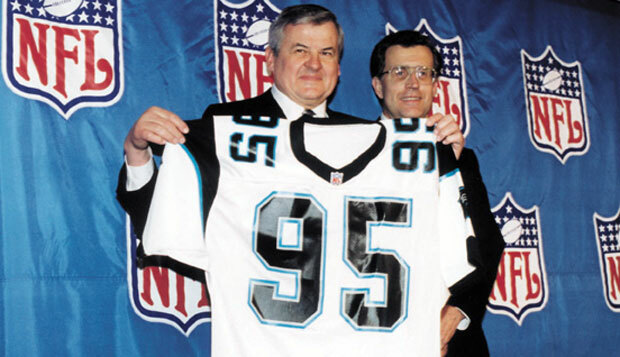 On December 15, 1987, entrepreneur Jerry Richardson announced his bid for an NFL expansion franchise in the Carolinas. A native of North Carolina, Richardson was a former wide receiver on the Baltimore Colts who had used his 1958 league championship bonus to co-found the Hardee’s chain of restaurants and served as president and CEO of TW Services. Richardson drew his inspiration to pursue an NFL franchise from George Shinn, who had made a successful bid for an expansion team in Charlotte, the Charlotte Hornets of the National Basketball Association (NBA). Richardson founded Richardson Sports, a partnership consisting of himself and his family; a number of businessmen from North and South Carolina were also recruited to be limited partners in the group. Richardson looked at four potential locations for a stadium, ultimately choosing uptown Charlotte. To highlight the demand for professional football in the Carolinas, Richardson Sports held a preseason game in the region in 1989, 1990, and 1991. The first two games were held in Carter-Finley Stadium in Raleigh, North Carolina, and Kenan Memorial Stadium in Chapel Hill, North Carolina, respectively, while the third and final game was held at Williams-Brice Stadium in Columbia, South Carolina. The matchups were between existing NFL teams. In 1991, the group formally filed an application for the open expansion spot, and on October 23, 1993, the 28 NFL owners unanimously named the Carolina Panthers as the 29th member of the NFL.